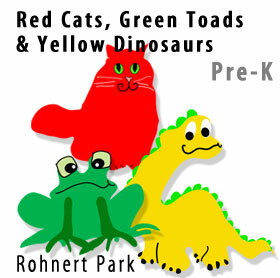 Learning to Learn has up to three Pre-Kindergarten groups: The Red Cats the Yellow Dinosaurs and the Green Toads. Each Pre-K group can consists of up to 24 children and 2 teachers. Children and teachers move through three classrooms on a rotation schedule that allows the children to participate in three basic areas of development: the Readiness Room, the Art Room and the Movement and Music Room/ Outdoor playground. Each classroom offers the children developmentally appropriate activities in a hands-on, theme based area of development. The Readiness Room supports growth in the area of readiness for academic skills such as: early literacy, pre-writing, pre-math, and fine motor development. The Art Room provides children with activities in varied art mediums that encourage individual creative expression as well as explorations in science and cooking. The Movement and Music Room is one of a kind with an indoor crawl space for children to participate in tumbling, climbing, dance, music, and dramatic play. The extensive outdoor area offers a variety of challenges for large motor activities including running, climbing on a climbing wall, swinging on a swing set, riding bikes and sand play. Our dedicated staff puts a lot of consideration into making this program and the curriculum one that your child will find challenging and fun. 12:15pm AFTERNOON SCHEDULE FOR ALL GROUPS – Children in both groups combine in the afternoon to make one group. 5:00pm – 6:00pm Move to Blue Bears/Red Butterflies Area So we may offer a more enriching program, all children in these groups might also be taken on a walk around the premises, or do another activity in different areas of the school.